The Knitting Pirate » In Which the Pirate Goes to SnB. « In Which the Pirate Continues to Stripe. In Which the Pirate Goes to SnB. I only got a few rounds past the point at which this picture was taken when my hands started seriously complaining about two straight hours of sock knitting. That being said, tonight's SnB was fun as usual! We had about fifteen people at the most crowded. Some crocheters and some needlepointers, but mostly knitters. I really enjoy talking to everyone, and showing the sock around. 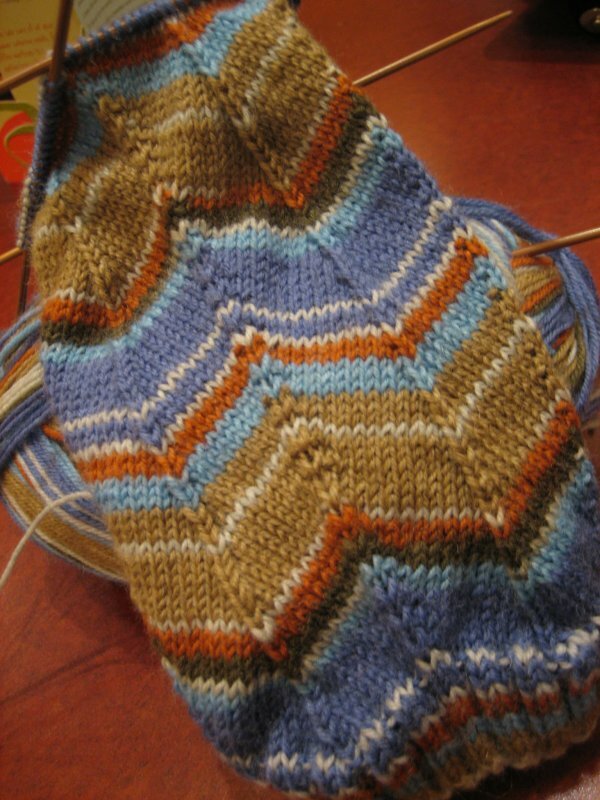 I demonstrated Continental knitting ("that looks weird, doesn't it?") and talked up the ease of flap heels to someone who's just getting into the idea of socks. Also, I came home with a bonus copy of "Knit 'N Style" magazine. I may not knit anything from it, but I love looking at the pictures and seeing what crazy ideas people come up with! The other cool thing about the SnB, I may have mentioned, is that we're working together on a charity blanket. I got the yarn for my four squares today, as well as the one border square that Pirate-Husband agreed to knit. My size 6 needles are free, so I can get started on my squares right away. Pirate-Husband is away on business... but when he gets back, I'm putting him to work! This entry was posted on Wednesday, June 20th, 2007 at 22:14 and is filed under pomatomus, SnB, sock, work. You can follow any responses to this entry through the RSS 2.0 feed. Both comments and pings are currently closed.